Bernadette Crehan, International Relations and Political Science. Class of 2020. When you get home for the summer and discuss your year at SJU with friends, its common to hear about their futures as teachers, nurses, or lawyers. While all these careers are important and admirable, its very different being an international relations major (or a political science major) where a common response is usually “what does that even mean?” Finishing my sophomore year as an international relations major, I’ve learned not only how to more fully answer that question, but I have also learned a few important lessons that I hope to carry with me through both the remainder of my SJU career and my life beyond Hawk Hill. I have learned the importance of diverse perspectives. Through my international relations course in African History and my political science classes, Intro to Political Thought and Protesting Inequality, I began to see my major as less of a study of “solving x globally” and more of an interpretation of why things happen and what can realistically be done in consideration of this. In this discipline, it is absurdly easy to fall victim to stereotyping and false assumptions; therefore, when looking at the world internationally it is incredibly important to be aware of the diversity in the world both globally and locally. In these three classes I learned that there are different sides to every story; I learned that those who hold power often control the narrative; and that taking action does not always have to be a grand spectacle, but instead can be small acts of organization or mobilization. Unlike many majors, where the focus is on one single subject, international relations combines different studies allowing for a more global perspective. Whether looking at the past or the present, as an international relations major my classes this past year have taught me to look beyond national narratives and toward a more critical and complex examination of the world. In addition to acquiring new skills, I have also learned that it is just as important to apply and practice them. Analyzing topics is important, but connecting with people is just as key as the issues you care about. In my year as a sophomore, forming relationships became a key lesson most learned through my participation in the Global Smarts program. 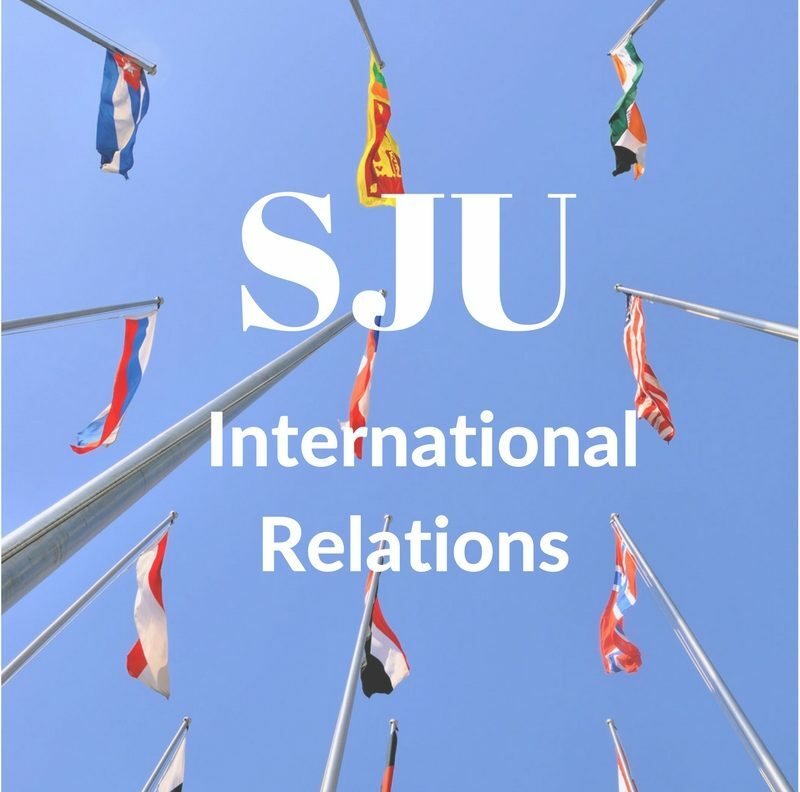 Global Smarts is a mentoring program between SJU and the World Affairs Council of Philadelphia. It is a program that pairs student mentors with intermediate school students to prepare them for their Junior Model U.N Conference. Participating in this program showed me the importance of thinking of oneself not just as an American, but as a global citizen. Working with middle schoolers and teaching them to think in the mindset of another country, showed me that as an international relations major it is not only important to know the facts and history of global issues, but rather it is important to be able to compromise with and work with others on them. Cooperation is often overlooked in our “look at me” society; however, global issues are simply too large for any individual. There is nothing like hanging out with middle schoolers once a week to remind you that creativity loves company, the importance of stepping back and taking some things less seriously, and lastly that no one is too young to start looking at global issues and decide they cannot live a life pretending to ignore them. Come the Fall I will be missing our international relations and political science departments dearly as I spend the semester abroad interning for the European Parliament (the directly elected parliamentary institution of the European Union) in Belgium. As all IR or political science majors know, as freshmen it is easy to originally be intimidated by professors in our departments. Taking classes with Dr. Liebell and Dr. Scola as a sophomore, however, is incredibly rewarding as you are able to get past that intimidation or nervousness in the classroom and truly immerse oneself in the material and more importantly in the class discussion. I’ll admit I have never been the first one to participate, but as the basic theories and actors in international relations become more clear and you decide the issue or region that most interests you, sophomore year is a time to bring that enthusiasm to your professors and let them guide you. I personally believe it is important to go through college with not only the mindset that you are there to be taught, but also that you are there to challenge and be challenge. The professors at SJU are brilliant, experienced, and offer incredible guidance but that does not mean you must accept everything you read or hear. Ask questions, challenge ideas, and continue to learn in new and surprising ways. Sophomore year is the perfect time to look around and find places to grow. No longer a freshman, things are no longer so new that they are frightening; while also not yet a junior the pressure to know your future is not yet quite so daunting. Although studying international relations leads one to want to solve all the world’s problems—to quote Dr. Scola—this year has taught me how important it is to take the time to find your “thread”. We may not be able to solve all the world’s problems, but imagining all the global issues as a tangled pile of threads, we can each pick up just one thread and get to work. So find where what you are passionate about and what you are good at meet and follow it. Sophomore year as an international relations major is full of discovery and it can be overwhelming, however it was a pleasure to experience— and to have finished— so that I can grow through even more experiences on Hawk Hill.